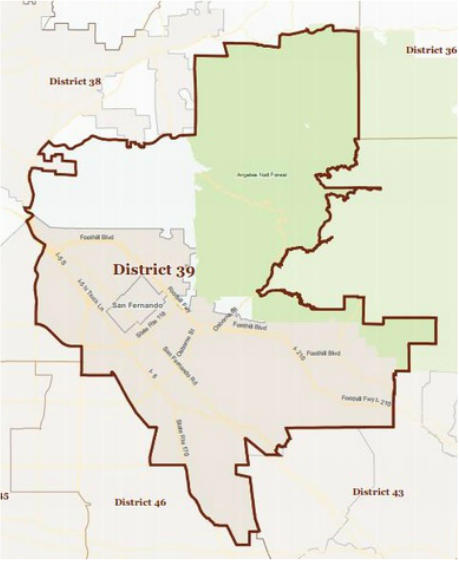 Democrat Patty Lopez currently represents Assembly District 39 and will not be termed out until 2026. Lopez is expected to face a strong Democratic candidate and it is likely that the top two candidates in the 2016 general election in this race will be Democrats. Assemblymember Patty Lopez (D-San Fernando) was elected to the State Assembly in November 2014 to represent California’s 39th Assembly District, which includes the communities of Pacoima, San Fernando, Arleta, Mission Hills, Sylmar, North Hollywood, Lake View Terrace, Los Angeles, Northeast Granada Hills, Sunland-Tujunga, and Sun Valley. Before being elected to the State Assembly Lopez was a former community representative for the North Valley Occupational Center. She was also a community activist for various community projects such as serving on site councils at San Fernando public schools. Moreover, Lopez helped form a parents’ grassroots group—Padres Activos SFV—to provide immigrant parents with greater information about their civil rights. A mother to four girls, a grandmother and married to Juan Lopez, Assemblymember Lopez is committed to making a difference in the community, especially through advocating for a quality public education for all children.